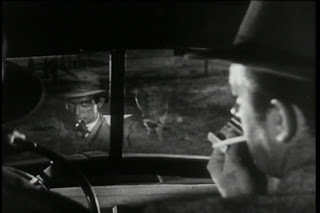 “In the police annals of Kansas City are written lurid chapters concerning the exploits of criminals and brought to punishment.” So begins one of the few film noirs to be set in my home state (although they drive through it in “Detour” (1945)). 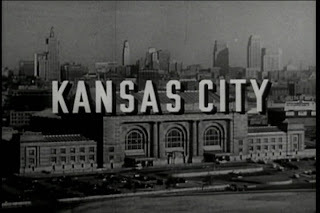 “Kansas City Confidential” (1952) is ostensibly a heist film, so it claims in the introduction, but both the heist and the Kansas location turn out to be almost irrelevantly minor aspects that are left behind after the first fifteen minutes. 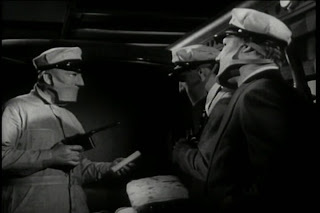 The opening third of the film follows a $1.2 million armored car robbery that basically involves three guys in masks pistol-whipping the carriers and speeding off with the cash in a flower delivery van. It seems a stretch to call it brilliantly masterminded. 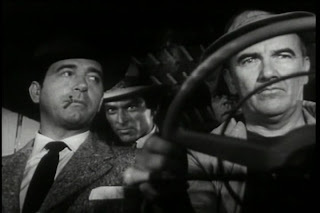 Joe’s investigation is a little difficult since the three thieves (the inspired combination of Lee Van Cleef, Jack Elam and Neville Brand) were coordinated by a masked boss. The boss met with each crony separately, so he knows them, but from then on everyone wears masks so that no one can turn stool pigeon on the rest. Joe tracks down one of the criminals, Peter Harris, and plans to join him on a trip to the money split in Barbados. 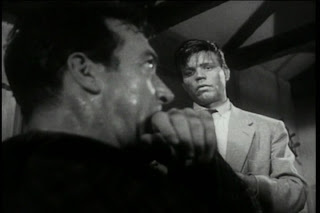 Only the crook is gunned down by the police and Joe decides to replace him. This brings us to the phenomenal final third of the film, where the tension and plot really shine. Joe must play a dangerous game of trying to draw out the other two thieves, who won’t know he’s not the genuine Harris. He also has to be careful since the mastermind might be around who would recognize him for a fraud. 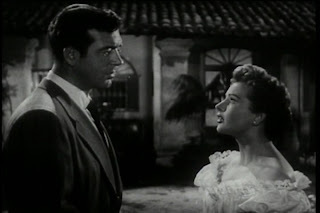 Meanwhile he’s falling in love with a local lawyer, the daughter of a retired police officer who seems to realize something’s up with all the grim strangers coming to town. Although even the ex-cop turned retired fisherman has secrets of his own. The cast is well chosen although their performances don’t always live up to their potential and chemistry. 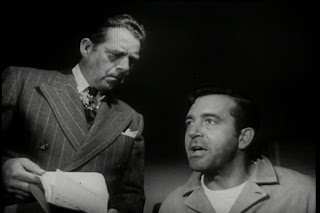 The beginning of the film, especially, plays more on caricatures and caper clichés than on anything dense enough to bite into. 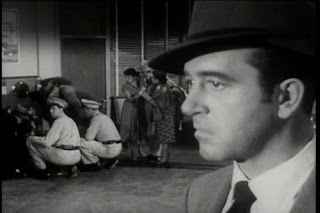 Once John Payne shows up to take on the protagonist position, things fall into place and his hard jaw, skeptical gaze and smooth delivery, not to mention his nimble ability to disarm thugs of guns, make him the most hard-boiled florist in film history. Each of the four main villains has an expressive menace that is unique and effective. 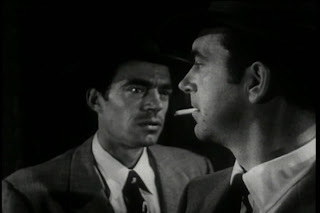 Jack Elam as Peter Harris is easily the worst for acting, but he also gets the least screen time. The three that remain in the final portions, plus Joe, make for a nerve-wracking four-way game of dog, cat, cat and mouse. Phil Karlson’s direction is not very flashy, and for this reason one can see why he never hit the big time. 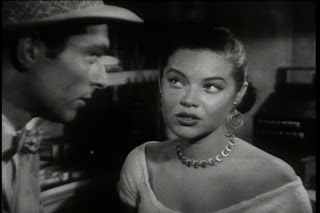 The visuals are fairly dry and minimal, probably owing to the rock bottom B-movie budget. The editing and pacing fare better, with the story developing at a fair clip and the tension rising exponentially. Karlson knows how to keep a twisted plot always up-in-the-air without making it confusing. The coincidence factor is extremely high, with Joe escaping gunpoint on at least five occasions, but always so cleverly or with such dramatic irony that I loved to play along. 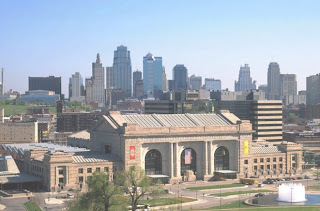 The influence of “Kansas City Confidential” is unmistakable, particularly its system of mutually-unidentified criminals and its focus on the post-heist battle of wits. The similarity to “Reservoir Dogs” (1992) with the crooks knowing only each other’s color-coded names (stolen more specifically from “The Taking of Pelham One Two Three (1974)) and set entirely after the crime made me suspicious and sure enough: the film appears on Quentin Tarantino’s top 100 favorite films. Apparently, Solid Snake's MGS4 look was modeled after Lee van Cleef. 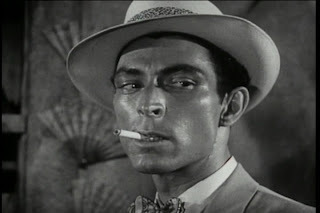 I love Lee van Cleef, as might be obvious. I'm assuming Solid Snake will be modeled after his better-known later career. It's tough to think of a better combination that borrowing from Kurt Russell in "Escape from New York" and Lee van Cleef in... anything. Maybe if you added in a pinch of Lee Marvin or Clint Eastwood. Solid Snake is the man we all want to be.